Description: It is a full-featured office suite that is compatible with Microsoft Office, Word Perfect, Lotus and other office applications. It is easy-to-use and feature-rich, performing nearly all of the functions you'd expect in an office suite, but at no cost. It comes with Impress for presentations, Draw for diagrams, Calc for spreadsheets, Writer word processor and other tools. 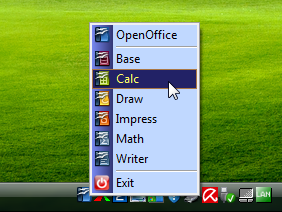 At this release you can also add our MyTrayOO tool, a tiny menu to have OpenOffice apps always available from the traybar (screenshot). You can finally read these Guides for more info.